Russian carrier Nordwind Airlines this month launched regular scheduled service to South East Asia from Moscow, including flights to Thailand and Vietnam. Operational schedule as follows. Attracting senior decision makers from the region's air service development community, Routes Asia provides the perfect platform to expand your connections and discuss route development opportunities. Register your place today and join the region's leading airlines, airports, tourism authorities and industry influencers in Chiang Mai. 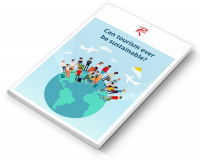 Download Can tourism ever be sustainable? Exploring how airlines and destinations are working together to help balance social and environmental concerns with the economic benefits of tourism.